Bloggery media rep dwillens is usually my go to guy in regards to hearing about new indie bands. I listen to a lot of music, but he listens to A LOT of music. 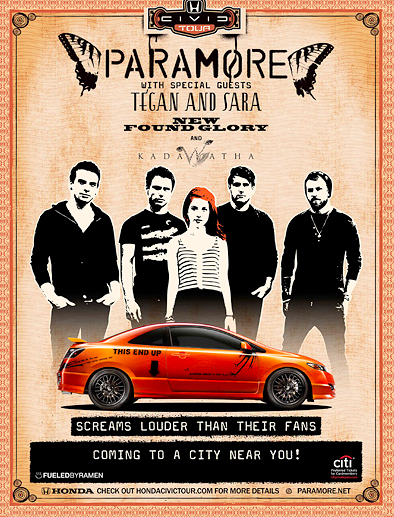 This time, though, it was via email that I heard about Kadawatha - who's going to be at the Honda Civic Tour tomorrow at the Comcast Center - 7/28. 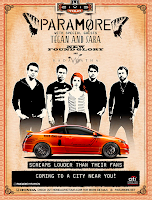 I'm reaching out to you on behalf of one of our pop-rock artists, Kadawatha, who is coming through Mansfield, MA on July 28th as part of the Honda Civic tour featuring Paramore, New Found Glory, and Tegan and Sara. This is the first major U.S. tour for the independent pop-rock band based out of Sri Lanka. I swung by their myspace page and am listening to a few of their songs while blogging. They're pretty good. Oh, and I also checked and there's still pretty good seats available for the Honda Civic Tour if you guys are interested in seeing them live. Click (here) to check out Kadawatha. 1 Response to "Kadawatha @ Honda Civic Tour - 7/28"
saw them in NH at the pavilion,WOW!! INCREDIBLE!! theyer on the way up!! M.C. Escher at the Museum of Science - NOW! Vote for Boston for VH1 Do Something Award!!! Jean-Georges Cooking at Market - Tonight!